BOSTON -- David Pastrnak had three goals and three assists as the Boston Bruins thumped the Toronto Maple Leafs 7-3 on Saturday to take a 2-0 lead in their best-of-seven first-round playoff series. Jake DeBrusk, Kevan Miller, Rick Nash and David Krejci also scored for Boston. Patrice Bergeron, Brad Marchand and Torey Krug each added. Tuukka Rask stopped 30 shots for the Bruins. Mitch Marner, with a goal and an assist, Tyler Bozak and James van Riemsdyk replied for the Leafs. Frederik Andersen allowed three goals on five shots before getting pulled at a raucous TD Garden. Curtis McElhinney made 19 saves in relief. The Eastern Conference quarterfinal now switches to Air Canada Centre for Games 3 and 4 on Monday and Thursday. 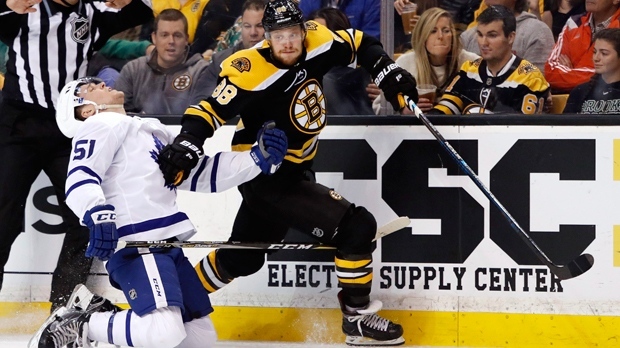 Boston's top line of Pastrnak, Marchand and Bergeron combined for six points in Boston's 5-1 victory in Game 1.